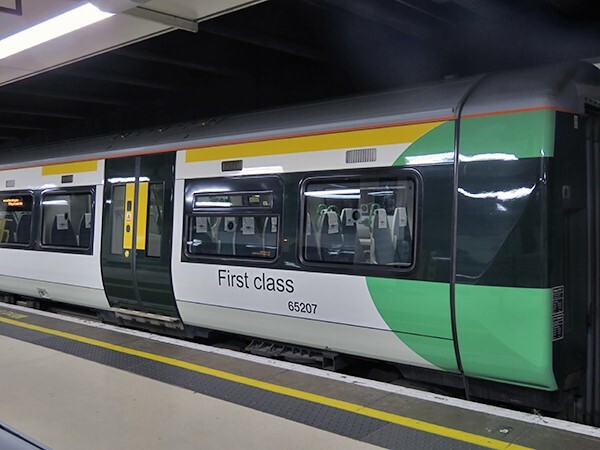 Arguably one of the significantly negative effects of the privatisation of railways in Britain has been the loss of standardisation of displaying the class and function of coaches. Each train operating company has been free to denote such things as it wishes and they have chosen to do so from using the obvious, such as retaining the use of the UIC convention introduced by British Rail in the 1960s, to the really obscure, such as South West Trains' blue dots. It is therefore little wonder that passengers become confused and sometimes get it wrong. The acting webmaster recalls accidentally sitting in a first class saloon on a refurbished unit operated by the then WAGN TOC, a saloon that was declassified to standard class when the units first emerged from works, because the only first class denotation was small dark green stickers, with small black writing (thus the combination difficult to read), stuck to the windows. Southern has always been good and first class accommodation has always been clear on its livery. They are therefore to be commended by making it even clearer. 377707 has now also (along with 377618) been adorned with UIC type wide first class yellow bands and large body-side labelling. Unlike the 377/6s, they have the accommodation at the inner end of one driving car, and the section is at least one seating bay smaller than the 377/6s, which have theirs at the cab end. Picture above is 377707 at Victoria with the 10:46 arrival from Caterham on the 18th February 2016.